Brian Marz's Fly Fishing Oregon Blog: It's Winter Steelhead Time - Officially! There have been catches of winter steelhead for about two weeks, but as of now it is the time where you can go out and target them. Many of the rivers towards the coast are falling into shape, and should fish well for the next several days. My friend went to a coastal river west of Portland today, and the river was in perfect shape (steelhead green), and there were several fish that were taken from bank fisherman. My friend hooked up with a fresh winter chromer before it gave itself a long distance release. At least he felt some power on the end of his fly line! There was also a chrome bright Chinook that he witnessed someone battling before the person with them messed it up attempting to net it. From here on out you can officially call it winter steelhead season, and that will remain the scenario until the end of March. 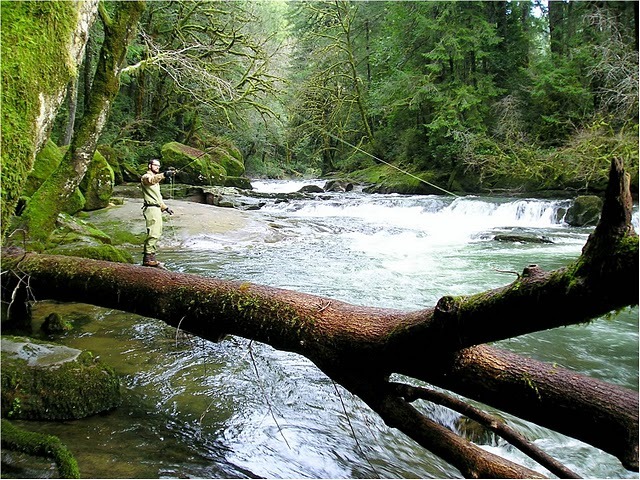 Winter steelhead season is a time where you can get out and enjoy the outdoors; while most Oregonians seem to suffer from "Cabin Fever". Even on the days where you do not connect with a fish; you are still out in the dreamy Oregon mossy laden forests taking it all in. When you have a day to get out, go for it, because more often than not, you will find yourself gaining more knowledge about the fisheries, and that leads to more success in your steelheading.